This getting the body I want and the Fuel A Better You Sweepstakes post has been brought to you by Nutrisystem…. If you are a regular reader here, you know I have been on a weight loss journey. I am proud to say I have lost approximately 25 pounds. I need to lose at least 10 more pounds to reach my goal, but I have hit a wall. THUMP. Full on hit a wall. Over the last 2 months my weight has been at a stand still. It’s so frustrating. I’m thinking I need to try something new. I need a jump start. I need Nutrisystem®. Yes, Nutrisystem® may just be my ticket. I’ve always heard great things about Nutrisystem®, it’s definitely a name I trust. After a little research of my own, I found out that…. Nutrisystem®, Inc. has been helping America lose weight for over 40 years. Through Nutrisystem’s® comprehensive program, they’ve remained at the forefront of the weight loss industry, and became a publicly traded company in October of 1999 (NASDAQ: NTRI), the same year they launched their innovative website, www.nutrisystem.com. Nutrisystem® paved the way for a new breed of weight loss companies with the introduction of live counseling by phone or online, replacing traditional customer visits to centers, and creating a new way for people to deal with weight issues privately. Losing weight is so convenient with Nutrisystem®. I can get quality food and meal plans delivered right to my door. I can find over 150 perfectly portioned® entrees and snacks on their menu. They also offer vitamins, supplements, cookbooks and a host of other tools created to help me maximize my weight loss goal. 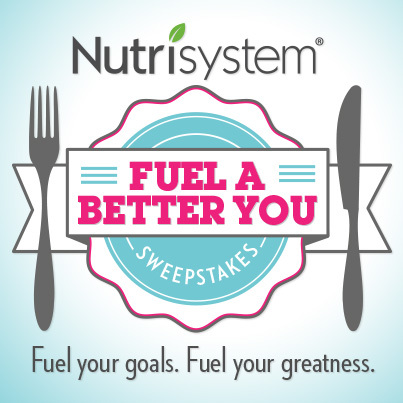 I have some great news, Nutrisystem® is sponsoring a sweepstakes — Nutrisystem Fuel A Better You Sweepstakes. To enter the Nutrisystem Fuel A Better You Sweepstakes, users can visit the sweepstakes tab on the Nutrisystem Facebook Page, fill out the entry form and press the enter button to submit their entry. One (1) Grand Prize Winner who will receive one Nutrisystem® Select® program, with 28 days of food products delivered to their door and five hundred dollars ($500) cash. Either prize will be a great way to get you on the road to your weight loss goal and a healthier you. As Nutrisystem® says, “Fuel your goals. Fuel your greatness”! This is exactly what I’m looking to do… Fuel my goals. Fuel my greatness. So be sure to join me and enter their sweepstakes and Fuel your goals. Fuel your greatness! Disclosure: I was compensated for this post but all opinions are 100% my own and may differ from yours. I will only endorse companies, products and services that I believe, based on my own experiences, are worthy of endorsement. I’ve heard many success stories with Nutrisystem. Thanks for telling us about the chance to win! I was on Nutrisystem for 11 months (June 2012 – May 2013)and lost just over 50 lbs. I can certainly say that it did work for me. I think it’s awesome that they have a menu you can choose from…I always wondered about that, because I am so darn picky! I need to do something like this. This is how, I think, many people can lose weight – it’s much easier when everything is pre-portioned out for you. Nutrisystem fan here too. Lost almost 80 lbs with them! Sometimes just throwing a little surprise at our bodies is enough to break through that wall and since Nutrisystem is a change for you, this could do it! I hope so. I’m really frustrated, right now, though. Thank you Liz, for the encouragement! Ugh I hate when weight loss stalls. I did the nutrisystem and I enjoyed it when I did. For some reason I can only stay on something for a month or two before I become bored. My cousin has gained a lot of weight over the last few years. She’s only in her mid twenties, but she’s having problems due to her weight. We’re all worried about her. We’ve all thought that Nutrisystem would be great for her. She’s not one for making her own food, so having the food delivered to her would be really good. I hope you loose those last 10 pounds soon! Thanks for the sweeps info! Nutrisystem does sound like a great way to lose weight. I’ve heard good things about Nutrisystem but I’ve never tried it. Good luck.